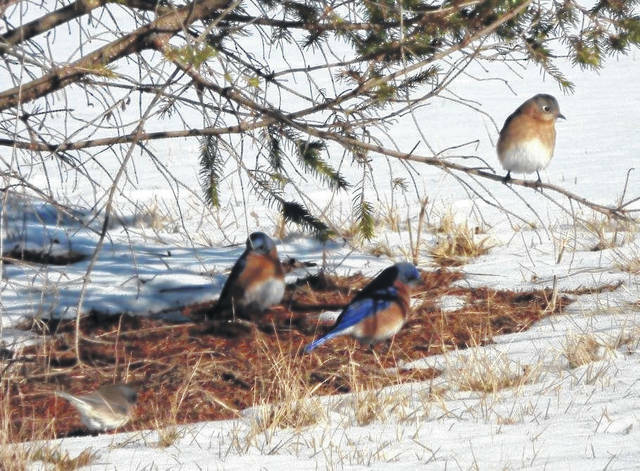 Eastern Bluebirds under a spruce tree at the Montgomery Soil & Water Conservation District. BROOKVILLE — Birding is one of the most popular pastimes in North America. Many people feed birds so they can get close-up views of their gorgeous colors and fun antics. However, the cost of special seed and feeders adds up quickly. Estimates show that 60 million people spend close to a billion dollars annually on seed and associated products. There is a better and cheaper way to attract birds. Attract a variety of birds to your yard by planting suitable trees and shrubs. The benefits are for you and the birds. Research from Texas A&M University shows that being in more natural settings helps lower stress. With 80 percent of Ohioans living in urban settings, maintaining a balance with nature is an easy, economical way to maintain emotional well-being. Nurturing a native ecosystem in your yard also helps birds. Like people, birds need food, water, and shelter to survive. Planting trees of different types, sizes, and forms encourages bird diversity. Try to include main forest ‘layers’, top, mid and lower tiers, in your yard. The Montgomery Soil & Water Conservation District (SWCD) Tree & Plant sale offers trees in all these categories to help you provide for your favorite new neighbors. Top Tier trees include tall-growing species like oak, hickory and maple as well as pine, spruce and cedar. These provide food, shelter and nesting sites to birds such as Scarlet Tanagers, White-breasted Nuthatches and Baltimore Orioles. Mid Tier trees such as serviceberry and dogwood attract Wood Thrushes for their fruit and as nesting sites. In the Lower tier, northern bayberry and creeping juniper attract Tree Swallows and Eastern Bluebirds. As you plan your tree arrangement, leave some clear spaces between the trees to encourage birds such as American Robin who need open habitats. You don’t have to have a huge spread with dozens of trees for songbirds. Even a few trees bring delightful results. Viewing songbirds in your yard is educational and fun. Regular visitors will depend on the trees you select. Review the characteristics listed for the Montgomery SWCD sale trees, consult your local forester, or reach out to the Montgomery SWCD for advice. Contact Kristen Lauer at LauerK@mcohio.org or 937-854-7645 ext. 0521 with questions. Go to www.MontgomerySWCD.org for links to both a printable order form and an online order form. Time is limited, so get your order in soon. Using nature’s bird feeders – trees – will leave you with more time to spend watching birds (instead of filling feeders), better provide for the birds, and save you money on birdseed.